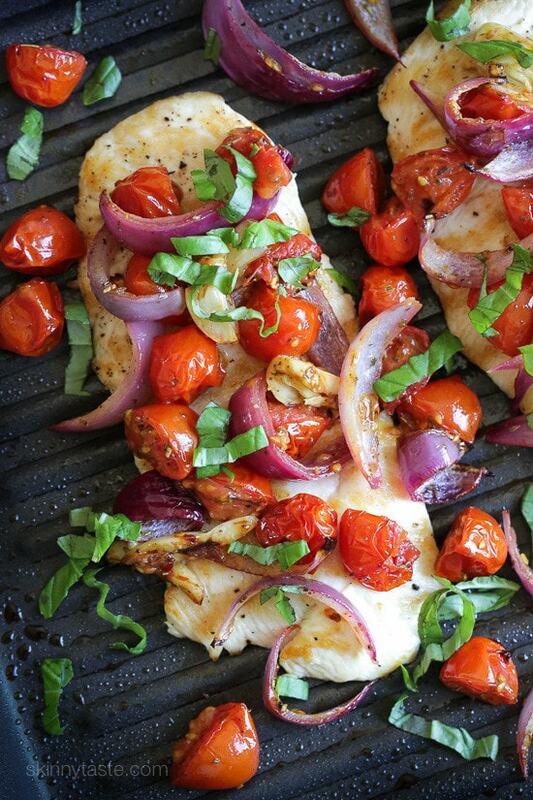 Roasted tomatoes, red onions, garlic and herbs adds tons of flavor to plain old chicken. Adding a pinch of red pepper flakes adds just a touch of heat, while the basil adds freshness to this easy, weeknight chicken dish. These roasted veggies are so good, and so pretty, it would also be great over fish such as flounder or sole. 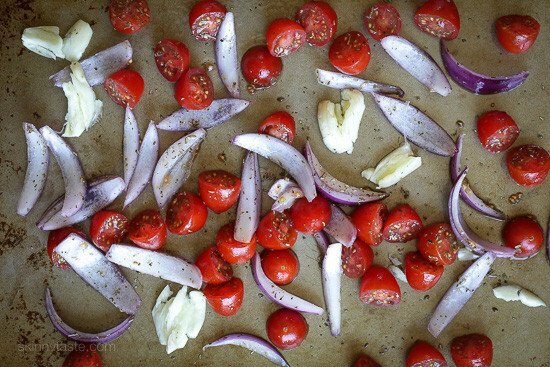 In a medium bowl, combine tomatoes, onions, garlic, olive oil, herbs de Provence, red pepper flakes, 1/4 teaspoon salt and black pepper. Toss to evenly coat and transfer to a sheet pan lightly sprayed with olive oil. Roast for 12 to 15 minutes. Meanwhile, cut the chicken breast in half lengthwise into 2 thin cutlets. Season both sides with 1/4 teaspoon salt and pepper. 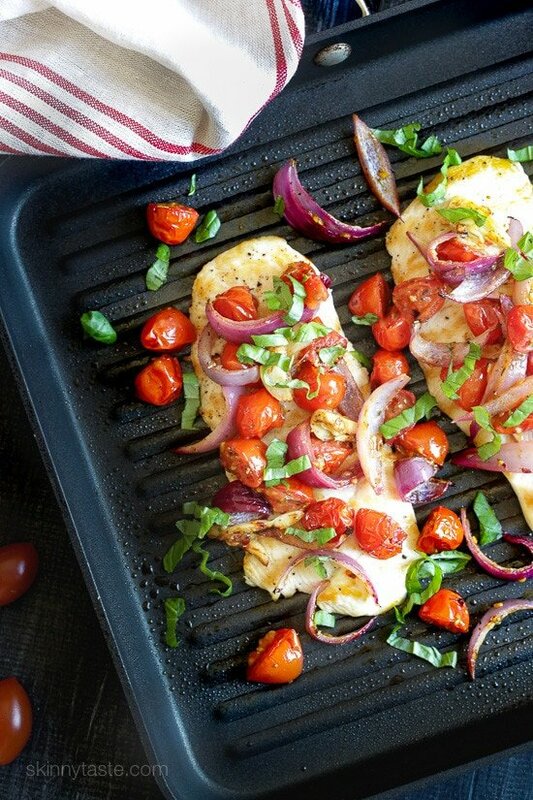 Spray a large non-stick grill pan or skillet with olive oil over medium-high heat. When hot add chicken and cook about 1 1/2 to 2 minutes per side. To serve: Top chicken with roasted veggies and garnish with remaining basil. 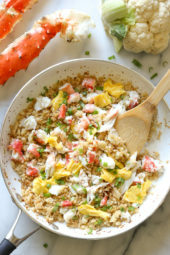 King Crab Cauliflower Fried "Rice"
This recipe was so easy, quick, and delicious to make! I lightly sprinkled the chicken with some Herbs de Provence as well. I will definitely be making this again. 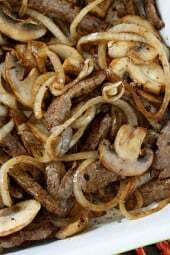 I’m in the kitchen and making this for dinner right now! Received the information on the new WW program and this recipe is the PERFECT choice. I had this for dinner tonight and it was delicious! I didn’t have herbes de Provence so in a pinch I used a little bit of oregano, coriander and sage instead. Had this for dinner last night. My husband and I both loved it. Was a very quick and easy meal to prepare for a busy weekday. I made this with regular yellow onions and I added yellow squash and tomatoes fresh from the garden. When I cooked the chicken I added some onion and sautéed the onions with the chicken in olive oil. This was a very tasty meal! I will be cooking it again. Made this tonight and it was delicious. My son, who doesn’t like tomatoes or onions, ate two pieces. I love the sweetness of the tomatoes. I had to broil the veggies at the end to get the right char. I may have overcrowded my pan though because I doubled the recipe. I definitely recommend this dish. I add pure maple and balsamic vinegar and its so tasty. Could I roast everything in the oven at once and add more veggies? The timing might be off. Absolutely delicious! I didn’t cut the tomatoes qmd I omitted the salt on the chicken. My husband I really enjoyed it. I just made this tonight and it’s so good. refreshing and healthy. I love it! Thank you! Made this using grilled peppers and onions instead of using the tomatoes and it was amazing! This was absolutely deeeelicious! I ended up using Roma tomatoes cut into 6 wedges, as the cherry tomatoes were 5 times the price. But the flavours were incredible! My picky fiance even went for a second helping of veggies, which is unheard of! Can’t wait to make it again! Gina! would love if you did the 21Day Fix container portions for more recipes! THIS IS AWESOME! I made this and it was nice enough but a bit boring really. I probably wont bother again with this one. I rarely leave comments for anything but felt compelled to for this recipe. I have made this recipe for my husband and I three times now and it has been fabulous each time! It has quickly become one of my husband’s favorite meals. In fact, he eats the leftovers for breakfast in the morning. Tonight I had some leftovers from a roasted chicken from Sam’s Club and wanted to use it. So I steamed the chicken in a little chicken broth and baked this tomato and onion recipe in the oven, then served the chicken smothered with this tomato and onion recipe. So good!! Thank you for this recipe Gina – It’s got such great flavor! We love it!! OMG! This was amazing and very easy to prepare. The vegetables were especially tasty. Will be making this one many times over – thank you! Made this last night, doubling the recipe to have enough for two meals for the two of us. Very tasty, though I might cut down on the salting of the meat before cooking. 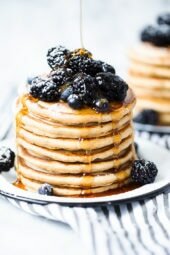 As someone about to start Weight Watchers, I'm glad I found this site when I did and look forward to trying many kinds of recipes. Thank you! I made this and it was delicious. My tomatoes got a little mushy so I think I will leave them whole next time. I just made this and it was great! I cubed the chicken and cooked in a skillet to make it easier. We had it over rice. Will make it again for sure. Thanks for yet another wonderful dinner! This looks DELISH! Can't get over the lower points with SP vs. PP in WW – that's wonderful news. Delicious!! I served it with oven baked risotto. I also browned the chicken and then threw that in the oven too. Dinner took 35 minutes and looked like I had slaved for hours. Thank you Gina and keep the recipes coming!!! This was crazy delicious – added asparagus to the roasted veggies and marinated the chicken in lemon, oregano, garlic, used Gina's Mediterranean marinade before BBQing. Great combination of veggies and so easy. I can't wait to try this….any suggestions for a side? Couscous, orzo or a big salad would be great. looks great. I would even toss them with a little balsamic at the end. Dried herbs, you can buy in the spice aisle or just use rosemary and thyme. When it says "garnish with remaining chopped basil"…what do I do with the basil first? It doesn't say anything about how much to put in with the roast veggies…help? Based on what I know about basil, I would think you'd only want to garnish at the end. Putting it on the roasted veggies while they are roasting might cause it to burn, it burns quickly! Good point, just add the basil last. So easy but so good! I don't like tomato…what would be a good veggie to replace it with? I'm in love. This looks awesome. Making Cheeseburger casserole for supper but I will have to make this next. Thanks for all your hard work. I love your recipes. Thank you Princess:) They look like they have been pounded in the photos. I've never heard of soaking them in milk before…hmmm… About how long would you soak them for? Sounds very light, fresh and tasty! I'm thinking a shaving of fresh parmesan on top would be lovely too! Looks great… Why so high in cholesterol? One serving has 87 grams of cholesterol, that's two hefty servings of cholesterol which should be divided into 2 meals… and it's still high! Just portioned several chicken breasts into cutlets last night and wasn't sure what I'd end up doing with any of them – perfect timing. Thanks! Looks easy and tasty – tomorrow's dinner is now planned! Can't wait to try 🙂 Looks so good and simple! !